Tocotrienol, a member of vitamin E family.The natural vitamin E family comprises four tocopherol and four tocotrienol isomers, namely alpha (α), beta (β), gamma (γ) and delta (δ). Throughout the past 30 years, very few vitamin E studies focused on tocotrienols although tocotrienols constitute half of the entire vitamin E family. In recent years, tocotrienol research has gained much prominence due to its potential health attributes. 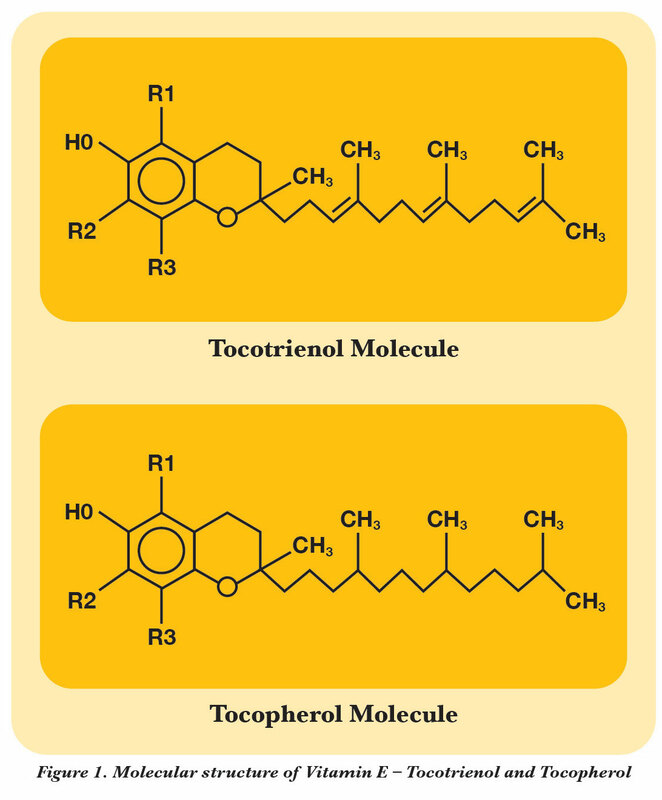 Tocotrienols are not only structurally different from tocopherols (see Figure 1), but also possess biological functions which are not shared by the tocopherol isomers. Tocotrienols are only available from selected plant sources.Tocotrienols are minor components in plants, mainly concentrated in cereals like rice bran, barley, rye and wheat germ. 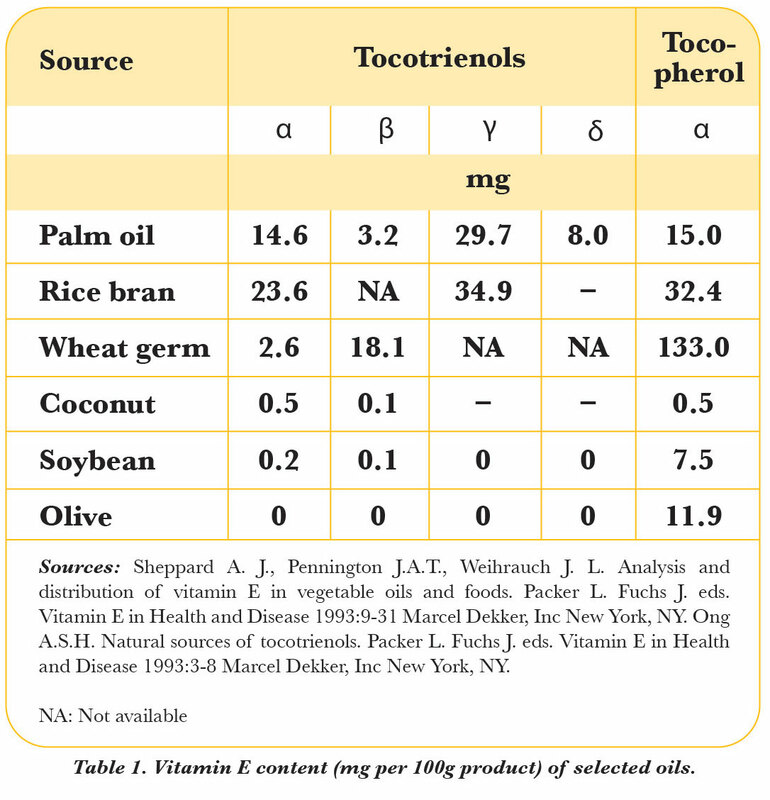 Unlike tocopherols that occur naturally in most common vegetable oils, tocotrienols are found only in selected oils such as palm oil and rice bran oil (see Table 1). Palm oil is the richest natural source of tocotrienols. Palm oil extracted from the fruits of Elaeis guineensis, is known to be one of the most abundant natural sources of vitamin E, with composition of approximately 30% tocopherols and the remaining as tocotrienols1. Palm and rice bran oils are the highest known source of tocotrienols in the plant kingdom2. Crude palm oil, contains tocotrienols as high as up to 550 mg/kg with mostly γ and α-tocotrienols. Tocotrienols have unique biological activities not shared with tocopherols. Tocotrienols have an unsaturated side tail which differs from tocopherols and this may account for significant difference in the biological activities of these isomers (see Figure 1). Tocotrienol is a more superior antioxidant. Due to the presence of a unique side chain, tocotrienol is able to penetrate into tissues with saturated fatty layers more efficiently3. This means that it can attach itself to the inside of cell membranes and hence exert its antioxidant activity. Studies also report that α-tocotrienol is 40-60 times more potent than α-tocopherol in preventing lipid peroxidation4. With such potent antioxidant properties, it makes tocotrienol an effective antioxidant in protecting against free radical-induced oxidative stress. Research conducted all over the world to demonstrate the various health attributes of palm tocotrienols. Tocotrienols particularly palm tocotrienols have demonstrated promising cardioprotective properties. Amongst the published studies that reported an ability of palm tocotrienols to reverse arterial blockage by decreasing the amount of cholesterol deposits in the carotid artery5. Tocotrienols also help reduce the production of endothelial adhesion molecules thus reducing the risk of developing atherosclerotic plaque6. In addition, they possess cholesterol lowering activity by inhibiting the HMG-CoA reductase that regulates cholesterol biosynthesis7. Due to the higher antioxidant activity, tocotrienols can be absorbed quickly and penetrate through the deep layers of skin. It was found that tocotrienols could accumulate at the stratum corneum of the skin with highest concentrations found in the uppermost of 5 microns8. Tocotrienols will promote healthy skin barrier in reducing oxidative effects for prevention of UV induced cancer like melanoma, and other related photo-aging effects when consumed orally or applied topically. Due to its significant antioxidant properties, tocotrienols are now widely being used in many formulations for cosmetic and dermatological applications. Tocotrienols portray an anti-cancer properties that are not demonstrated by other antioxidants. It may not only help to prevent cancer but has an ability to block cancer cell growth and initiate apoptosis – a process whereby cancerous cells commit suicide. Interestingly, tocotrienols only induce programmed death in certain cancer cells while sparing other healthy cells. This ability is not found in tocopherols. The efficacy of palm tocotrienols in suppressing cancer cell growth has been widely studied in various cancer cells such as breast9,10 , prostate11,12, and pancreas13. Tocotrienol, particularly α-tocotrienol is the most potent neuroprotective form of vitamin E. It protects neuron death at an extremely low level (nanomolar concentrations)14. At such low doses, tocotrienol was reported to be able to reach the brain and to provide protection against stroke15. It is interesting to note that, only α-tocotrienol but not α-tocopherol, protects neural cells from neurodegenerative diseases by virtue of its more superior antioxidant property. Tocotrienol is indeed one of the most fascinating members of the vitamin E family. Abundantly available from palm oil, tocotrienols are regarded as the millennium’s most promising natural resource in influencing human health and disease prevention. Palm oil has a history of food use of over 5000 years and has emerged as a preferred oil of this millennium by billions all over the world. More than 150 countries worldwide favour it for its natural, versatile and excellent properties. To those who wish to reap the benefits of this oil and its products, the Malaysian Palm Oil Council (MPOC) will be your trusted information provider. Please visit MPOC website at www.mpoc.org.my for more information.